Beach Lane Books, 9781442414525, 40pp. Can an ugly dog with a heart of gold find a home? A warm and clever picture book for animal lovers of any breed. When Spike, the winner of the Ugliest Dog in the Universe contest, is abandoned by his owner, Joe, the boy next door, is determined—against all odds—to adopt him. Things look grim until Spike foils a neighborhood catnapping plan—and saves the day! Debra Frasier has written and illustrated many acclaimed picture books, including Spike; A Fabulous Fair Alphabet; Miss Alaineus: A Vocabulary Disaster; and the beloved and bestselling On the Day You Were Born. She lives in Minnesota with her husband and frequently visits her home state of Florida. * "Spike, an abandoned “Ugliest Dog in the Universe”–contest winner, finds love and a new home in this heartwarming tale about beauty—and its many permutations. Verbally abused and cast away, Spike’s resilience and optimism remain—largely due to Joe, the kind boy from next door. First-person narration makes the dog all the more endearing: “If you could see inside my heart, you’d say...beautiful.”... Frasier’s exceptional artwork and text will have readers rooting for the lovable Spike. Using found materials, she creates ingenious collages that act as metaphors, revealing beauty in what once appeared useless and worn-out. Blue jeans tell Spike’s story, hard-working and durable; they also connect him to Joe and his mom, who both wear the fabric. Evangeline, the award-winning cat, is surrounded by silk and lace. Seamlessly integrated design enhances both emotional and comedic beats, as the author reveals beauty in its myriad forms. "Using secondhand denim both for a canvas and for collaged elements, Frasier (A Fabulous Fair Alphabet) tells the happy-sad story of a sensitive canine soul.... Frasier is...an undeniably inventive artist who uses her raw material in unexpected ways—turning multiple waistbands into a frame, making the jeans’ double stitching serve as steps on a porch, and playing with rips and frays to convey a sense of inner beauty exposed. And Spike himself is very much like a pair of well-worn, much-loved jeans. Not conventionally pretty? Sure. Steadfast and comforting? Absolutely." 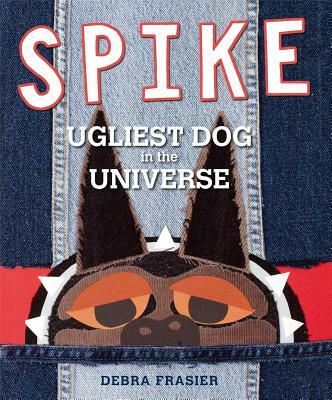 "Spike is a short, squat canine whose master leaves him for a cat-loving girlfriend but not before forcing the poor fellow to enter the Ugliest Dog in the Universe contest.... Spike gets a chance to prove that creatures who may look rough around the edges can still be big-hearted, quick-thinking, courageous stalwarts, and he earns himself a future of warm companionship. An affectionately humorous tale with big stakes (especially for dog lovers) and a classic refrain of “don’t judge a book by its cover” are bolstered by unusual collage-style illustrations, prominently featuring torn jeans. This may sound odd on the surface, but the swaths of ripped denim give Spike and his story just the scrappy, ragtag feel they need."